NOTE: The below instructions have been tested with CodeIgniter 2.1.0 and TankAuth 1.0.9; and they work fine. There is one additional change that must be done in the config.php file (CI), it is related to the new parameter ‘encryption_key’. 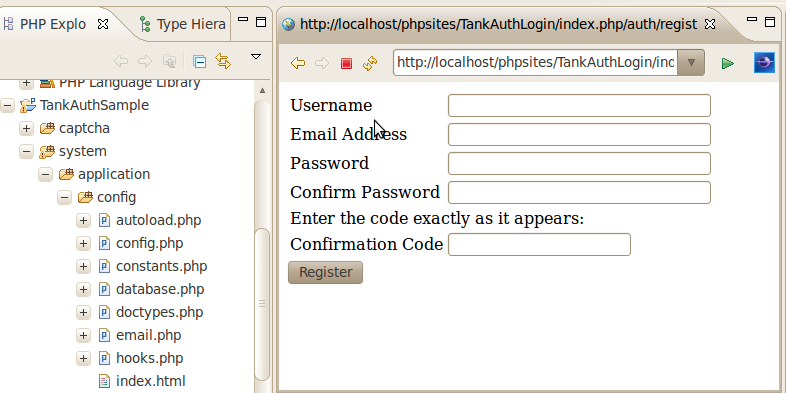 Tank Auth is an authentication library based on DX Auth, developed for the PHP framework CodeIgniter. This brief tutorial shows the steps needed to install TankAuth. 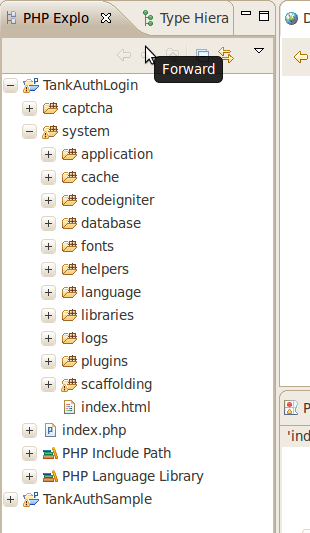 Eclipse Galileo (3.5) with PHP Development Tools (PDT). 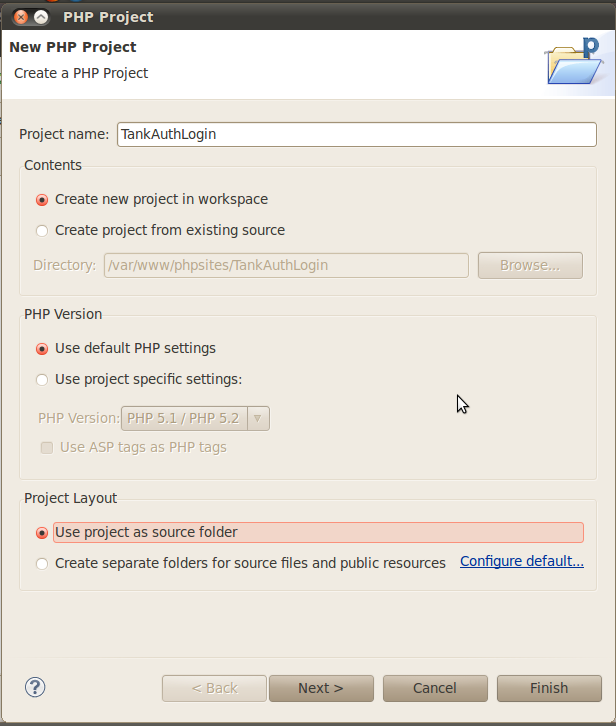 The first step is to create a new Eclipse PHP project by selecting FILE → NEW → PHP PROJECT. 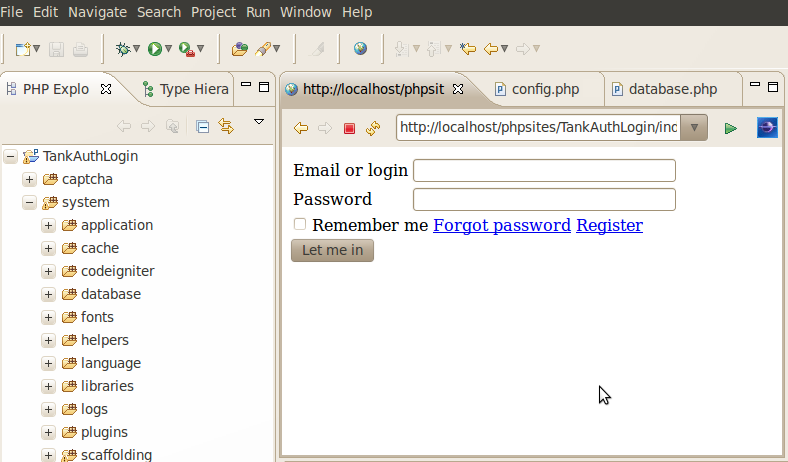 The project name I used was TankAuthLogin and the default options should be selected (to keep it nice and simple). * The new project should be created in the /var/www/phpsites folder. This folder was configured to store all the web sites and it is accesible via http://localhost/phpsites. Copy the APPLICATION content folder into CI APPLICATION folder. Copy the CAPTCHA folder to the CI folder. Create the TankAuth DB tables (described below). 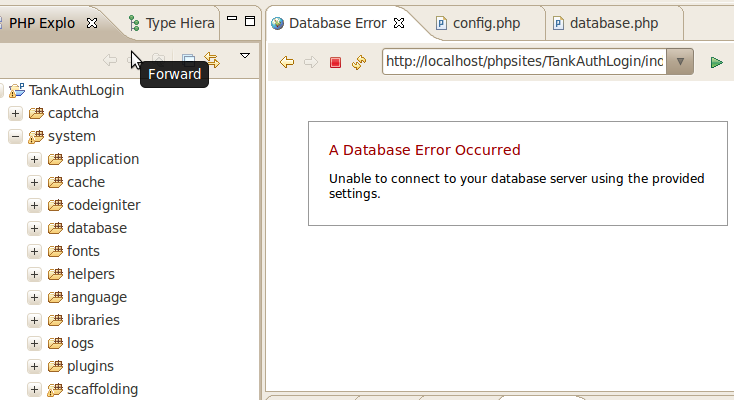 Open APPLICATION/CONFIG/CONFIG.PHP file and update the $config[‘sess_use_database’] variable to TRUE. 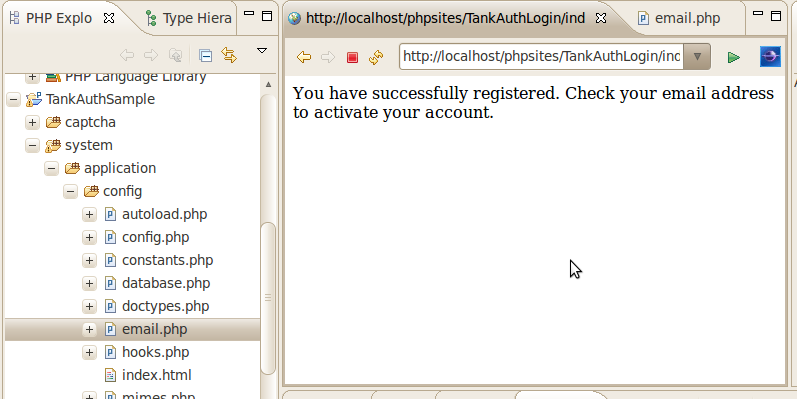 NOTE: Unlike DX Auth, Tank Auth does not create a default user. You must create a user on your own. But before doing that, you must configure the CAPTCHA plugin and set the email parameters. This last step is needed because Tank Auth will send an activation link (by email) when a new user is registered (This functionality is also used on the “forgot password” option). NOTE: This command provides an easy way to set up the permissions on this folder, but you MUST NOT keep full write/read access when your code is under production. GMAIL is being used as the email provider in this example, but you can always use a different provider. This entry was posted on Thursday, January 20th, 2011 at 11:44 pm	and posted in PHP. You can follow any responses to this entry through the RSS 2.0 feed. Thank you, this worked perfectly. You saved me a headache. It seems there is a bug in one of the CI versions. You might want to check this thread. Is there any weay to set Thank login to be on the first page i get this loop error when i set Tank as root in config file? Howdy, I discovered your blog on http://expertnotfound. wordpress.com/2011/01/20/setting-up-tank-auth-2/ at the same time as browsing for a related topic, your blog came up, it seems great. Hey! thank you. I am glad you liked it. 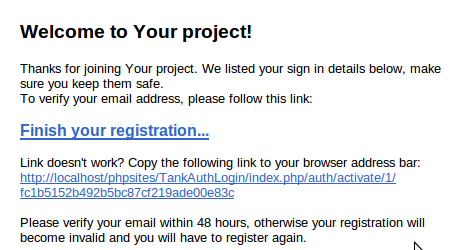 thank you for your blog .but my tank auth is not sending an activation email to the registered user. Have you checked the logs? (/var/log/apache2). You might have a problem with your credentials. 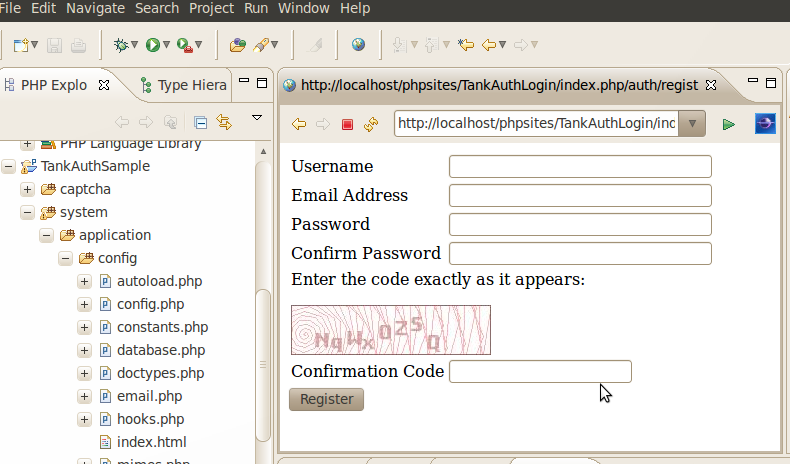 You should try to debug the _send_email method found in auth.php. Unfortunately, the register method does not check if the email was sent successfully before displaying the ‘success’ message.